Cédric: I'm over feeling shame, now. I'm not ashamed to be with you. Best love story between men I have ever seen. Being American, it is difficult watching subtitled foreign films. We have such a genre of films in this country as it is. It also makes someone stop multitasking to sit and read the script. It was a pleasure and an uplifting experience watching this movie. It is SO difficult coming to terms with being gay and seeing "sterityped" films with gays on drugs, whoring around, and eventually dying of AIDS. 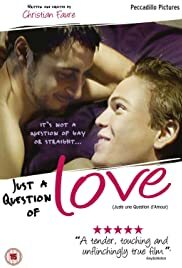 This is one of the few films that positively deals with love between two men and the difficulties that truly must be overcome. True love will make the most jaded, closeted gay person throw all cares and insecurities to the wind. I mean, whose life is it anyway??? What an uplift!! Please watch this movie! !